It is well known that traffic flows, vehicles speed and acceleration closely concern traffic pollution. Therefore, calculating these characteristics as precise as possible is really relevant when dealing with such a phenomena. Usual tools in computing the values of traffic characteristics are traffic assignment models. A relevant component of these models are networks loading models allowing to calculate link flows from path flows. Existing networks loading models can be divided into aggregate and disaggregate models (microsimulation models). The latter ones allow the car-following and then a precise calculation of traffic parameters but they need considerable computing resources. In this paper, a mesosimulation model has been developed to study the flows propagation on the network. Since the proposed model is disaggregate as for flow characteristics and aggregate as for links performances, it does not need great computing resources in calculating vehicular speed and acceleration. 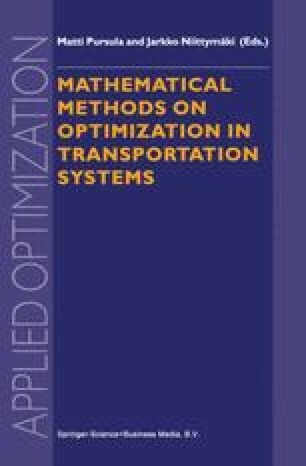 Therefore, utility of this model entirely appears when dealing with simulation of traffic pollution.